During the winters of 1790-91 Washington was busily engaged with the four planters who lived on the left bank of the Potomac, settling the terms on which they would consent that their plantations should become the site of the future capital. It would seem as if no great exertion would be required to induce these gentlemen to agree to exchange their boundless acres of forest and half-tilled plantation for the crowded and valuable squares of what was expected to be the largest city on the continent. But David Burns, "that obstinate Mr. Burns," as Washington call­ed him, who owned the whole of the west end of Washington; was for some time opposed to the arrangement. For three generations, he and his ancestry had lived on that spot and had acquired a wealth that old Scotland had denied them. The place was originally laid out as a plantation of six hundred acres; and so small did that amount of land then seem that it bore the name of the Widow's Mite. But by degrees the place grew and enlarged till it stretched from Georgetown to where the Capitol now stands. In 1790, its owner was the justice of the peace for the whole neighborhood and somewhat choleric withal. 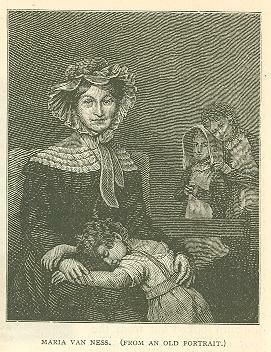 And tradition relates that when the President was one day telling him of the great advantages of the proposed plan, old Burns gruffly burst out - "I suppose, Mr. Washington, you think people here are going to take every grist from you as pure grain; but what would you have been, if you hadn't married the widow Custis?" The southern border of the Burns plantation was a little stream, still flow­ing below the Capitol, well - known to every Washington boy as the Tiber, and to every classical scholar there as the Yellow Tiber. During the past winter, that stream has been walled and covered in, so that its waves no longer greet the light till they reach those Botanical gardens where Congressional horticult­ure flourishes at national expense. On the very spot where the Capitol now towers by the side of that little stream, lived, generations ago, an old gentleman, who was extremely fond of a practical joke. His own name was Pope; his plantation he therefore christened by the name of Rome, and the stream at the foot of the hill where he dwelt he called the Tiber. Very frequently did he bore his guests with the oft-told tale that America, as well as Europe, had its Pope, dwelling at Rome, on the banks of the Tibet! How it would have delighted his honest old heart, could he have foreseen that the ground where he then dwelt would in other days be known as the Capitoline Hill. It required some time and much talking to reconcile all the diverse elements; but at last David Burns and his plantation ­neighbors consented that their homesteads should be converted into the capital of the nation. One half of the land was to be given up to the public, the old proprietors to retain the other half. For all lands taken for public uses, they were to be al­lowed one hundred dollars for every acre and a half. Major L'Enfant, a French engineer of note, was selected to layout the new city. He made, his streets run due North and South and named them after the numerals; or else due East and West, designated alphabetically. The French minister of that day remarked to Gen. Washington that his engineer must be an infant in mind as well as in name to call his streets A, B, C, and 1, 2 and 3. David Burns, planter, Justice of the Peace, owner of the many broad acres that lay between Georgetown and the present site of the Capitol, lived in a small cottage, a little back from the river, on the square now lying between 17th and 18th streets. That planter's mansion of the last century still stands, as represented on our page, under the shadow of its overhanging trees, and is still kept in good repair by its present owner. Here Mr. Burns, who had but lately lost his wife, was bringing up his two children, just passing out of their teens, when President Washington insisted on thrusting a great fortune upon them. The old gentleman had dedicated his son to the law, but the young gentle­man's health had failed, and he passed away to a better world just as popula­tion was beginning to pour itself over the parental plantation. His death left the young lady sole heiress to all that part of Washington, now occupied by the White House, the Treasury, the Ob­servatory, the Patent Office, the Post Office, the Smithsonian, the Agricultural buildings, and the aristocratic mansions of H, I, and M streets. The conver­sion of this large plantation into the squares of a city that was to be the metropolis of the nation, made Miss Burns the wealthiest partie then living in this country. The presence of Congress close by her doors, held in a small place, where there was almost no society, brought to her feet scores of Congressional bachelors. They had not the slightest objection to taking charge of the fair form and large fortune of the rich heiress. 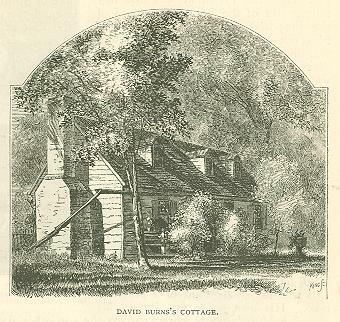 Politics was discussed in the Capitol; love, in the cottage of David Burns. For the young lady was just nineteen and very beautiful. Her complexion was one of dazzling fairness, her eyes full of playful fire; but her most attractive feature was the air of goodness that continually dwelt upon her face. Always at ease and always having to put others at ease, lovely, quick-witted and cultured, Miss Maria Burns would have been the belle of society in any city on the continent; at Washington she was its queen. It would hardly be fair to the memory of the gay young gentlemen of the Congress of 1802 to state how many of them failed in their attempts to secure the great prize. It is more to our purpose to relate that among the gallant members of the first Con­gress that ever assembled at Washington was the Hon. John P. Van Ness, of New York. He belonged to that patrician and aristocratic family that then occupied the magnificent country-seat of Lindenwald, subsequently owned by Mr. Van Buren. Mr. Van Ness had been educated at Co­lumbia College, and had studied for the law, but had been forced by ill-health to give up its practice. He was now a representa­tive in Congress, thirty years of age, of fair talents, and, what is of no less importance in the eyes of young ladies, of handsome and commanding appearance. His family and Congressional standing gave him prestige in society: his abilities confirmed the favorable impressions his manly looks created: and he was much aided by the in­fluence of his political friends. The dis­position of the greatest fortune then in the matrimonial market was the object of much speculation among those whose thoughts were supposed to be given to legislation. Mr. Vice-President Aaron Burr, then of unspotted reputation,. was one of his staunchest supporters. While General Van Ness was closely pressing the besieged fortress, with some hopes of success, David Burns died, leaving his daughter the sole owner of a goodly num­ber of slaves, and the most valuable piece of rising real estate in the United States. The poor girl was now solitary enough. Father, mother, and brother had all passed away, and she dwelt alone in the little cottage by the riverside. Cir­cumstances forced her to a decision, and on the 9th of May, 1802, the day she at­tained her twentieth year, she surrendered her name and fortune to her handsome suitor. 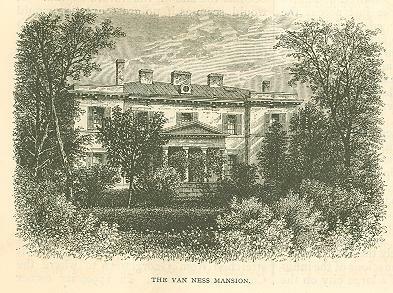 Mr. Van Ness ceased to represent New York, and became the owner of more than half of Washington. One of the earliest acts of the new pro­prietor of the plantation was the erection of a large and costly house, built out of the sales of land that passed to the nation and to individuals. In its day it was the most expensive private mansion in the United States; it was the first in which hot and cold water was carried to all the cham­bers. Latrobe, the architect of the White House, drew the plans, and superintended the erection. It is said that even Mr. Van Ness, extravagant as he naturally was, was horrified by the continual calls for money for the new building, and at last remon­strated strongly with the architect. Mr. Latrobe coolly replied, "That's your busi­ness, to find the money. I have nothing to do but draw the plans, and build the house." Beneath its capacious basements are the largest and coolest wine-vaults in the country! and it was in these dark re­cesses that it was the original intention of the conspirators who afterwards assassinat­ed Mr. Lincoln, to conceal their captive, had they succeeded in their original plan of capturing him alive. The house, when built, was consecrated by its owner to hospitality. No other man­sion in this country has opened its doors to so many and such illustrious guests. Monroe and Madison, Clay and Calhoun, Webster and Hayne were the friends of her husband, and her frequent visitors. From Washington to Jackson there was not a President of the United States who was not her friend and guest. General Van Ness was fond of display; the sale of the plantation had given him ample means; and nothing pleased him more than to see the political aristocracy of all parties crowd­ed round his ample board. But his wife, while meeting all the claims that fashion and wealth could present, led an inner life of much religious beauty. The loveliness and simplicity of her original nature re­mained unchanged until death. Wealth never corrupted her; prosperity never withheld her hand from the wants of the deserving poor. For thirty years her house was the center of Washington's best social life. Her husband's position, as Mayor of the capital, constrained him to a continued hospitality in which he took great delight. But her real happiness was found in other things. Religion, and charity, and the care of the orphan were never forgotten by her; her life was a train of unostentatious chari­ties. In riper years her heart was fixed on the training of her daughter, and she made it her own work to educate that daughter for all the realities of life. It was part of the daily duty of both to read together the Word of God, and together to meditate on its solemn truths. They were congenial minds; and neither the difference of age nor the overflowing happiness of youth ever led the fair daughter away from her mother, or her religious duties. And when mar­riage came, and Miss Van Ness became Mrs. Middleton, the lonely mother could cheerfully see her daughter depart, for she well knew how fitted was that daughter for all that life or death could bring. Death soon came in the train of childbirth; and when the daughter and her little infant de­scended into the grave, the mother's heart descended with them. 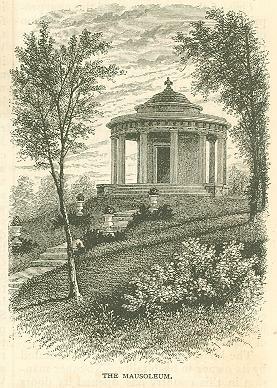 For the family was built one of the most beautiful mausoleums ever constructed in this country; perhaps, at the time of its erection, the most beau­tiful. It was the exact pattern of the pil­lared temple of Tivoli. All that part of H Street, then on the outskirts of the city, now its very center, the mother dedicated to religious uses. At the right of the grave rose the Church of the Ascension, for which she gave the land; on its left the Washington Orphan Asylum, to which she gave not only the land, but four thousand dollars. Between these two buildings, the one consecrated to religion, the other to charity, was erected the mausoleum that was to await her decease. Death came to her at last, as it comes to all; but not until she had enjoyed all the pleasure that wealth, or society, or fashion can give, and found how frail and worth­less they are when compared with religion or affection. She died in September, 1832, when she was just fifty years of age; and she received, what no other woman in the United States has ever received, the honors of a public burial. Just as the funeral train was about to move, a delegation of the citizens of Washington entered the room, where her remains were lying in state, bear­ing with them a silver plate, with the following inscription: "The citizens of Wash­ington, in testimony of their veneration for departed worth, dedicate this plate to the memory of Maria Van Ness, the excellent consort of J. P. Van Ness. If piety, high principle, and exalted worth could have arrested the shafts of fate, she would still have remained among us, a bright example of every virtue. The hand of death has removed her to a purer and happier state of existence, and while we lament her loss, let us endeavor to emulate her virtues." The long procession then passed away from her former home to her grave between the church and the asylum. At the gate of the asylum stood its little inmates in line, while the procession passed through the midst of them. After the body had been placed in what should have been its last abode, the orphans came to strew the grave with branches of weeping willow. "What should have been its last abode?" The place she herself chose between the church and the orphanage. Here were gathered the last remains of her husband, her child, grandchild, and herself. Of all her large estate in Washington she asked only a grave; and her request has been denied. For forty years her body lay in the place of her own selection, but without a friend or relative to guard that sacred dust. In these forty years Washington had grown from a city of eighteen thou­sand inhabitants to one of one hundred and ten thousand. Land had greatly increased in value, and could not be spared for purposes of sepulture. The tomb was, therefore, left in such neglect that its removal was demanded as a sanitary measure. The bodies were ex­humed by strangers, and carried to Georgetown, and the mausoleum removed with them. The pecuniary value of that last resting place has now returned to stranger, heirs, who loved the place of her grave better than her memory or her wishes. Originally published in Scribner's Magazine. 1873.